Meditation isn’t just one thing. 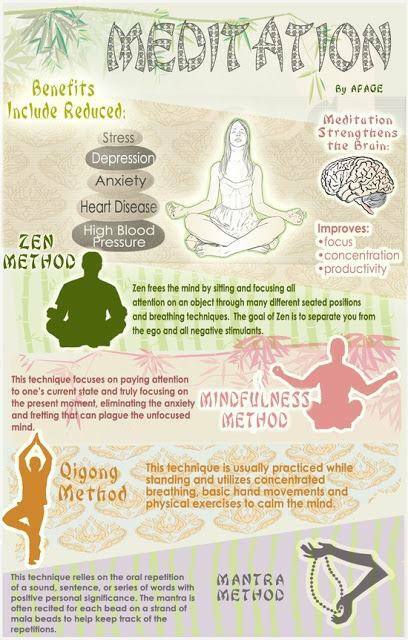 There are many techniques of meditation, each with various benefits. Your mind is a muscle, and meditation is a way of working it out, with each technique working on a slightly different part of our mind. But rather than go on and on about the benefits, how-to’s, styles, etc… I thought it would be more practical to simply share some links in order to allow for your own discovery. As time goes on, I will add more to this list, but this is what is available now. Here’s an article for those who might be questioning the usefulness of meditation. Or, if you’d rather have it in infographic form, go for it. Either way, numerous studies continue to espouse the benefits of meditation, even if it has a bit of a PR problem. This article discusses how anxiety affects you, but also how you can wade through the waters. How does meditation affect your brain? This article is a good place to start… so is this one. Take after Sherlock Holmes, so says this New York Times article on meditation. Take a look at this article from MIT. Can you meditate without meditating? Short answer, yes. This article explains how. A short article about the benefits of a few meditation techniques. Here are descriptions of a few common meditation practices/techniques.